After defeating the wretched Khan, Elissa sets out on an unforgettable journey, which will take her from Alhamazar to Gravesport by way of a swamp to find her father and her lost friends Maya and Gertrude. 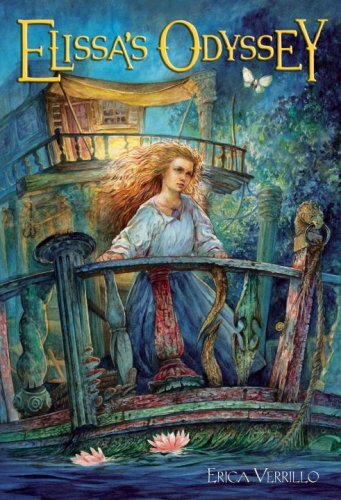 Elissa boards the Swamp Maiden where she meets a lively crew of jolly sailors. Along the way she encounters many unique experiences and even rescues a Count with a dark past from the brink of death. Throughout her journey, Elissa ponders a few important questions such as: will she be reunited with her father and her two best friends, and will she figure out who the other four Gifted ones are that Om Chai entrusted her with locating? Elissa will have to learn to control her strength-gaining powers before they control her if she wants to complete her daunting mission and set things right in the world. I really enjoyed Elissa's Odyssey by the aspiring author Erica Verrillo. This was definitely much better than the first novel in the trilogy and it really set this trilogy in flight. It was really interesting and had good humor. The plot was really well written and kept my attention astonishingly. There was a good use of words and foreshadowing. The action was plentiful and well played. This trilogy was continued very well and it got better as the story went on. It was very suspenseful and had me wanting more. I am greatly looking forward to reading the next book called World's End to see how Elissa's story will end. The new characters that were introduced were very interesting and unique from one another. They were fairly well described but I would've like a little more description of the characters though because at times they were hard to picture. There were a lot of surprises scattered all across the pages throughout the novel. The ending was spectacular and had me guessing about what was yet to come. The beginning started off a little slow and was slightly boring but once more of the plot and the events started to unfold the story was very intriguing and captivating. The author definitely impressed me with this novel and highly surpassed my expectations. I'm looking forward to reading more by this author and I definitely recommend Elissa's Odyssey, which is book two of the Phoenix Rising Trilogy.